Last week the US warned of military strikes on Syria “if” government forces use chemical weapons (CW). This week, Trump comes clean by dropping any mention of a CW pretext – simply warning Syria not to attack terrorists. Trump tweeted his warning to Syria, as well as its allied Russian and Iranian forces, to not launch a military offensive to retake control of the northwest province of Idlib. The area is the last remaining stronghold of illegally armed militant groups in Syria. It’s potentially the endgame to the nearly eight-year war. So, alleged chemical weapons are no longer part of the US rationale. It’s basically: don’t make any military move. The American president added that “hundreds of thousands of lives” could be lost if Syria and its allies move to rid the province of an estimated 10,000 militants among a civilian population of three million. Trump’s apparent “humanitarian” concern seems alarmist, if not cynical. When did he articulate similar misgivings when US air forces were pounding Raqqa to bits last year, causing thousands of civilian deaths? This week, Russian and Iranian officials are working with Syria to set up humanitarian corridors in Idlib to remove civilians from harm. Russian President Vladimir Putin is also due to arrive in the Iranian capital, Tehran this weekend to give impetus for a final peace settlement. Clearing Syria’s last bastion of terrorist groups in Idlib is crucial to restoring peace for the entire country. Why are Washington and its allies trying to obstruct that end result? Trump’s dire-sounding reproach of a final military offensive in Idlib marked a significant shift from earlier warnings issued by the US and its NATO allies, Britain and France. All three powers had last week vowed to take military action if chemical weapons were used by the Syrian Army in the anticipated offensive. Those admonitions were widely seen as an attempt by the Western powers to set up a false-flag provocation to blame the Syrian government forces and thereby give themselves a pretext to launch military strikes against President Assad. For a start, the Syrian government no longer possesses such weapons, having deleted its arsenal under verified UN supervision. The Western chemical-weapons alarm was a transparent ruse. The same dramatic formula was deployed earlier this year in April when an alleged toxic incident in Douma near Damascus was attributed in Western media to the Syrian Army, resulting in a barrage of over 100 missile attacks by the US, Britain, and France on Syria. It turned out, however, that the incident was a propaganda stunt orchestrated by the Western-backed White Helmets, which have time and again liaised with terrorist groups for information warfare. This time around, numerous reports cited Russian military intelligence that chemical weapon materials were being transported in Idlib by the terrorist groups and White Helmets for a repeat of the false-flag ruse. Those reports exposed the lie behind warnings from the US, Britain, and France of impending air strikes as being nothing other than coordinated efforts to justify military intervention. Further, it was widely commented that the US and its NATO allies were in effect shown to be actively in league with the terrorist groups in preparing a false flag with chemical weapons. It seems that having been caught out in orchestrating a propaganda stunt, the Western powers have simply gone for broke. That is, going for an openly direct line of attack. Forgot about the alleged use of chemical weapons – for Washington, the mere action of military offensive by the Syrian government is illegitimate. Fortunately, Syrian, Russian, and Iranian leaders are immune to such ridiculous suppression of sovereign rights and international law. As Russian Foreign Minister Sergey Lavrov has pointed out, Syria is legally mandated to eradicate terrorist groups occupying its territory and to assert full authority over the country. Would the American, British, or French government accept the occupation of their territory by illegally armed groups which have been covertly sponsored by Syria, Russia, or Iran? 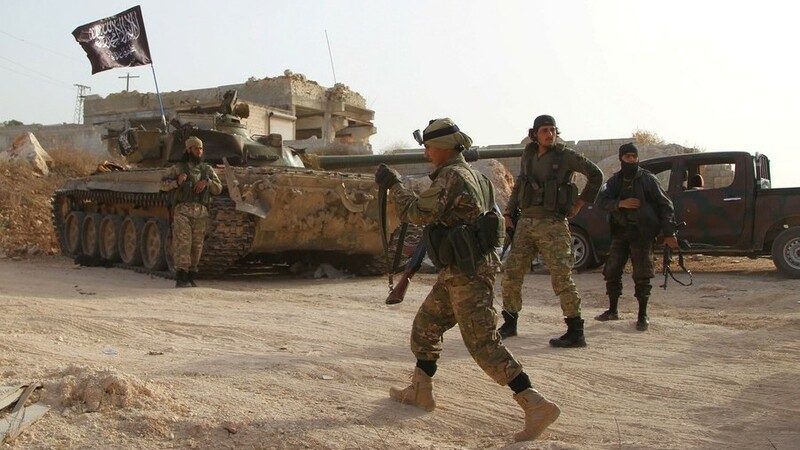 It is abundantly evident that the militants who have gravitated to Idlib are the assorted Al-Qaeda-affiliated terrorist groups, primarily Hayat Tahrir al-Sham (formerly Al-Nusra Front). This organization is designated as a terrorist entity by the US State Department, as well as by Moscow and many other governments. There is no longer even a wistful mention in Western media about “moderate rebels” or the so-called “Free Syrian Army,” which the US and its NATO allies previously claimed to be supporting as distinct from the extremist head-choppers. That apparent distinction has evaporated into thin air like the manufactured illusion it always was. What we have in Idlib are the vile dregs of the proxy terrorist army that the Western governments have been covertly sponsoring and arming all along for their criminal objective of regime change in Syria. Trump’s warning against a military campaign to finally smash the terrorist army in Syria amounts to an astounding admission. The endgame of protagonists is now exposed for the whole world to see. The United States, Britain, and France are admitting that their real problem isn’t alleged violations with chemical weapons. Their real problem is that the last stand of the terrorist groups is about to be vanquished. All those years of Western scheming and plotting against the Syrian government and sponsoring bloody mayhem with terrorist proxies are facing a spectacular defeat. And not only that, these Western powers are demonstrably, from their words, on the side of the terrorists who have ransacked and brutalized Syria into a charnel house. Trump’s appeals regarding Idlib about a “grave humanitarian mistake” are nauseating. The “hundreds of thousands of lives” he seems concerned about have already been lost due to the covert war sponsored by the US and its allies using terrorist proxies. These terrorist groups are supposed to be the enemy against which the US and its NATO partners had launched a global war over the past two decades, during which these self-proclaimed defenders of civilized values devastated whole countries from Central Asia, the Middle East to North Africa. Millions of lives have been destroyed by the US and its Western allies supposedly on a crusade against terrorist groups which these same powers are evidently now trying to protect in Syria. Trillions of dollars wasted, and Western societies saddled with austerity to pay for these wars. Informed critics always suspected the US-led ‘War on Terror’ to be a giant fraud to cover for criminal imperialist objectives of conquest. In Syria, the endgame of the war on that country is proving the case that the US and its NATO allies are pursuing interests that have nothing to do with fighting terrorism. Their interests are embedded with the terrorists.